Total Computing Solutions has a wealth of experience in providing IT services to a wide range of industries and business types. We focus on helping small businesses to develop and grow through the use of technology, providing them with the best value of solutions for their IT investment. We service an extremely wide range of industries and we work hard to provide specific solutions and services based on each business’ needs. We do this by building strong, long-lasting relationships with our clients and by maintaining a core set of values and ethics that allow us to achieve such a high level of service quality – Giving you a reason to continue with our services. Reliability: We understand the danger of an unresponsive IT company and we work to ensure that any problem our clients face is addressed as fast as possible. Enhanced Communication: We’ll help your workforce improve collaboration and connectivity by helping you implement a unified communication network for your business. Increased Security: Outsourcing your IT to Total Computing Solutions means having the confidence that all of your important data is safeguarded by technology security experts. Business Continuity: We will work with your company to create a plan to limit downtime when disaster strikes. We provide backup solutions that will have your workforce back to work quickly after a system crash. We are an IT provider that will take an interest in your small business and help you find the best solutions to suit your unique needs, no matter what your industry. 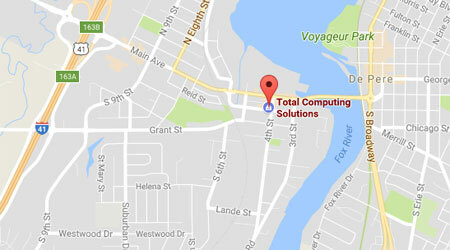 Give us a call today at (920) 569-2681 or send an e-mail to service@tcsdepere.com to find out more about what Total Computing Solutions can do for your business.